Hello and welcome to my Christmas card exchange!! I love getting X-mas cards!! I have SOOOO many Christmas cards that I bought from last years Black Friday. What better way than to share them with all of you. Details: Send each of your Swap-Bot partner(s) one (1) store bought (or handmade if you choose to be so brave) Christmas themed card. What to Write? This is a free for all. Feel free to write what your heart desires. If you need a little inspiration, you could write about holiday plans or holiday traditions. You could list the 10 reasons why you like this holiday. Those are just a few ideas. I'm really waiting for the dispatch to start. Hi! I just wanted to clarify something. I have a ton of really nice boxed Christmas Cards from Papyrus. Are these acceptable to send? Can we send Christmas Postcards? I just wanted to say that I wasn't ignoring any of these comments. I was checking back regularly for awhile and nothing for weeks. It is just hard to keep track of when you don't get an alert of sometime. So, sorry for the delay. @satinifaction thanks for the offer to help angle. I will take you up on that offer if it arises. @klepa23 I am glad to hear that you're excited for the swap to start. And as the rest of your probably are too. I am equally excited! Just wanted to clarify/answer some of the recent questions. Any Christmas themed card is acceptable. Whether it be a greeting card or postcard. Naked or in an Envelope. It is all welcomed. Also, regardless of the type or brand. Hope that covers the most recent questions that have come up. Let me know if there are other questions. I can help angel if needed as well. I can help angel if anyone needs too. Looking forward to the swap. Hi, I've signed up to this and still want to take part, but I'm not sure who I'll be sending a Christmas Card to yet, when will I get a 'partner' ? Thanks. Partners will be assigned after November 15. Where do you paste the code in to have the Charlie Brown pic on your page? Cute cute picture. Thx! @flmom Thanks for the compliment. When you host a swap there is a spot to put an image or an images link. I found one that was 300X300 pixels on the internet and saved the link in the spot for the swap. 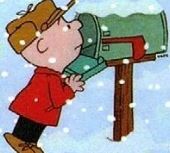 I just did a google search for Charlie Brown Christmas to find that image too. Hi, perhaps a silly question, but I've put my username (EDC83) and the words "Swap-bot Christmas Card Swap" in the 5 Christmas cards I've sent to the partners assigned to me, as I thought that was a good idea. That's ok, right? Also I got a Christmas Card today from Belgium, but I'm not sure if it's for this... How would I know if it is? Thanks. @EDC83 you can look in the rate my partner section on the swap and see if their name matches what you received. If you've joined other swaps, you can look there too! I will angel if needed! @itsLinds I am sorry to hear about your loss of your grandfather. Sending good thoughts your way during this time. Thank you for the heads up. I have e-mailed your partners to let them know in case they don't read the comments. Take care. @FireCat91 Thank you for the offer. I will let yo know if I need the help. So far, so good. Cards were dropped in the box tonight for Monday a.m. pickup out to my partners. Enjoy! I’m already angeling 😇 for those that had @Mishi for a partner. I need help angeling the partners @kenzie2806 and @MistressKitten had. I’ll be reaching out to those who offered to help. Thanks so much for those who joined my swap and sent on time to their partners. It was a great turn out if I do say so. You didn't vet the participants, did you? @kenzie2806 has a 1-rating from Jan 2018 and 2 1-ratings from November 2018 only a few days before you assigned partners and she had late swaps on her dash (even swaps she was hosting herself). @hg08 has 6 1-ratings (at least some from active swappers) and 14 3-ratings! So far @kenzie2806 and @mistresskitten have no 1-ratings for your swap. You should contact their partners so that both get rated the 1s they deserve and get susoended! I received a Christmas card by an angel for this swap- thank you Jamie! Wishing you all a wonderful 2019 filled with happiness and good health.